The Poldarked team had a night out at the theatre last weekend and caught Blue Orange by Joe Penhall at The Young Vic. One of the cast is Luke Norris, playing a young, well intentioned doctor, clashing with his older professional colleagues: sound familiar? Blue Orange is very different territory to Poldark however. 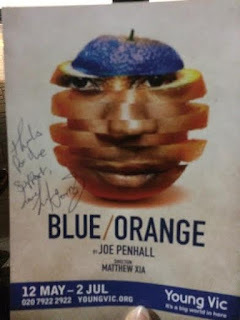 Directed by Matthew Xia, the play looks at the relationship between a young black man, Christopher (Daniel Kaluuya ) who has been confined to a psychiatric ward for a month and his doctor, Bruce (Luke Norris), who wants to section him as he thinks he's suffering from psychosis; amongst other things he still thinks oranges are blue. 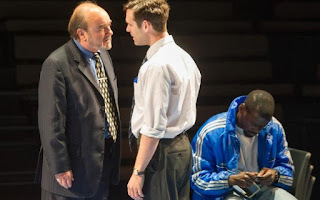 The older consultant (David Haig) disagrees and thinks it's just a question of Christopher's culture being misunderstood by an ethnocentric system. Bruce pleads with Christopher whilst consultant, Robert looks on. The play raises many questions about the diagnosis of mental illness, race and modern society and ends without giving the audience the answers. 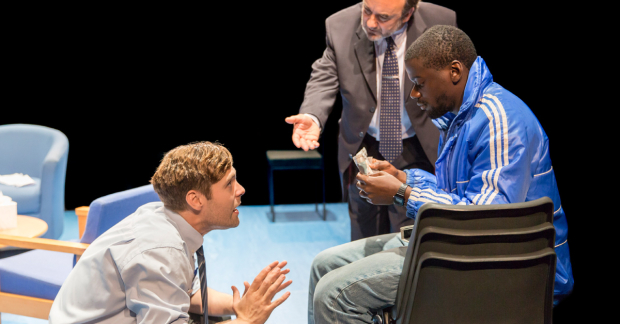 Although some things have changed since the play was originally staged the issues of institutional racism and how bed space dictates treatment remain. It's gripping, cutting and funny and I've been thinking about it ever since. With just three characters and lots of dialogue the actors need to be at the top of their game and they are throughout. The play is performed in the round and uses the space well, giving the audience the feel of being in the room (the entire play is set in a consultation room in a psychiatric hospital). For such a serious subject the Blue Orange is surprisingly funny and the humour adds to the empathy. It has a bit of everything and it's no surprise the play won an Olivier Award when it was first staged in 2000. If you can get it see it we'd highly recommend it. Blue Orange runs until 2nd July. You can book tickets from The Young Vic.